My newest orchid. It followed me home last weekend. It's flowers are perfectly formed yet so tiny. It's a mass of small white blooms. 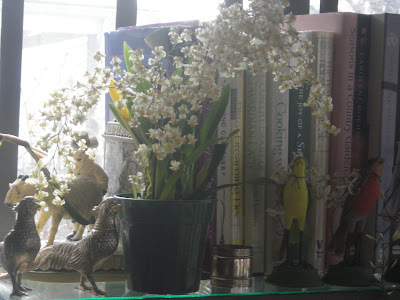 I've "collected" orchids for several years and before we had the breakfast room, they resided on a table in the dining room with a south exposure. They were happy there. The success in orchid growing is not the ability to keep them alive but the ability to get them to rebloom. Phalaenopsis is the most common variety and are often found at big box stores. Most of my orchids are Phalaenopsis and they are easy to grow and also fairly easy to get to rebloom. They come in many colors and their blooms are long lasting. I have another variety, although I can't remember the name, which is the most beautiful shade of orange and I have gotten that one to rebloom. The newcomer, the new little guy, is full of blooms. It's a smallish plant. But the best part is that it was on sale for half price! A great orchid at a great price. It's blooms are brightening the breakfast room. And one of my Phalaenopsis is blooming and another is budding. It's a great time for the orchids at Linderhof. The Great Dane loves orchids, and is the one in this house most likely to bring one home. There's nothing quite like them, is there? Wow! I've never seen an orchid of that variety; it's breathtaking! Looks lovely with your decor also. I used to be so afraid of orchids. Never bought them fearing I’d kill them. After my husband received one as a get well gift ten years ago, I learned to love them. I keep them in my closet in front of a south east facing window to coax them to rebloom. They seem to love it there. Phalaenopsis are my favorite. I’ve not had as much luck with Cymbidiums or Dendrobiums. I had one bloom for five months-it came from Home Depot.